A Major Shift: We Made It. Finally. Over six months ago (probably more like 8) I started this website on a spiritual prompting I felt. Part of the theme of it was that our (my family's) lives were about to take a major shift. Personal and spiritual reasons played a big part of that, but also involved was the inclination I felt to move across the country. Hence the name, "A Major Shift". After many months of planning, we finally made it back to the land where I grew up. I make it sound like some foreign land. It's not. It's Pennsylvania!!! But for most of the people who surrounded me in Utah, Pennsylvania was foreign. Most of them have never been past the Rocky Mountains, so I may as well have been from Germany to them. It's a foreign land. Anyways, we escaped those Rocky Mountains, and I felt like I could breathe. I could see past the horizon, and the sun woke me up an hour earlier each day. As we drove and drove and drove, I could breathe the humidity in the air. Most people don't enjoy humidity. I love it. It carries the smell of mulberry and locust trees, peonies and fresh cut grass. It's heavenly. After 4 long and intense days of driving, we finally arrived. The sign says, "Smile. 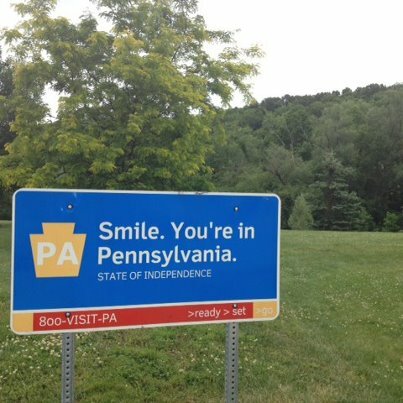 You're in Pennsylvania. STATE OF INDEPENDENCE". Oh yes, I smiled. And then I cried my eyes out through just about the next 5 towns. Tears of joy. After many years of being away, I finally was home, and am so glad to be here. Look at those trees. And the green grass. No sprinklers are required. My little girl got stung by a bee while we were at this rest stop, but after throwing some clove oil on, she was good as new. The kids have played outside for HOURS since we've been here, and being the "State of Independence" could not feel more true. It truly is wonderful to be home.